Albion 295 Series is designed for high capacity and better load distribution with the lowest possible overall height. 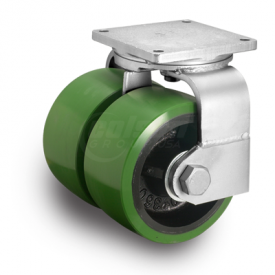 295 swivel casters have differential action when changing direction, greatly reducing the scrubbing effect resulting from use of wide-faced, small diameter wheels. Casters with “BBL” denote a Ball Load Swivel Raceway, and feature a 7″ diameter machined and hardened load raceway with ball bearings, for smooth movement and extended wear. The thrust bearing is a 1-1/4″ tapered roller bearing.